In restaurants across South America’s largest and most populous city, Sao Paulo, customers are being served drinks and meals on plastic cups and plates. The reason? A severe shortage of clean water, exacerbated by drought, means there’s no water for washing dishes. A burgeoning urban population and the effects of climate change are likely to exacerbate Brazil’s water woes. And given Brazil’s evolving role on the international stage, as an agricultural giant and a standard-bearer for a group of emerging economies, this will have both domestic and international security implications. In July of 2014, Brazil’s Public Ministry, a federal regulatory agency, recommended that São Paulo state begin rationing water immediately. According to the Los Angeles Times, the government rang the alarm in late July when its study of the crisis indicated that “the Sistema Cantareira could go totally dry in less than 100 days.” The Cantareira System is the primary source of water for almost nine million people, approximately half of the Metropolitan Region of São Paulo (MRSP). The Brazilian government has invested heavily in waste water treatment in recent years, and has implemented innovative programs, such as one that directs funds collected from water consumers to pay farmers that protect riparian forests. But the combined impacts of reservoir pollution, water line leakage, flooding, and inefficient water use practices, exacerbated by a persistent dry spell, has the MRSP — the seventh most populous urban area in the world – on edge. But São Paulo is not alone. The 2011 Urban Water Supply Atlas estimates that the regions that supply 73% of the country’s water needs could face shortages over the next decade. Already over 140 Brazilian cities have implemented water rationing during the worst drought in over twenty years, with some neighborhoods only receiving water once every three days. The affected cities represent approximately six million people, the majority of whom are employed in the agriculture industry. In addition to potential crop failures, the disruption to the work life and health of agricultural workers could significantly impact the country’s food supply. Further, Brazil is the world’s leading exporter of soybeans, coffee, orange juice, sugar and beef, so these water stresses can also have a marked impact on the global food market. 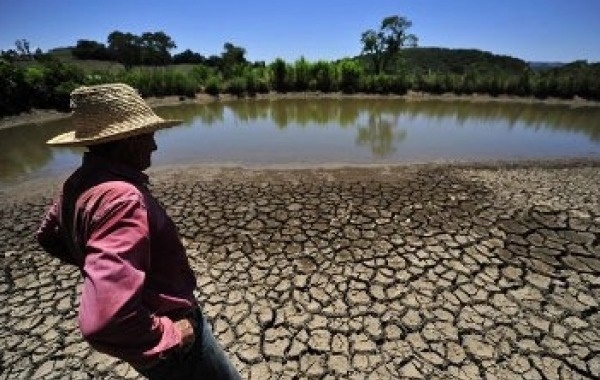 Climate change and urbanization multiply the threat to Brazil’s water supply. The Intergovernmental Panel on Climate Change (IPCC), in its most recent assessment of the South American region projects that under varying emissions scenarios, substantial warming in temperature extremes can be expected by the end of the 21st century. The panel’s research further forecasts the likelihood that the length, frequency and/or intensity of heat waves will experience a “large increase” over most of South America. The cause of the increasing episodes of heat waves in the region is principally decreased rainfall and/or increased evapotranspiration in Amazonia and North East Brazil. The IPCC also cites the urbanization process in the MRSP as having affected the local climate, and that the intensification of the heat island effect (i.e. built up areas that are hotter than nearby rural areas), may be responsible for the 2°C warming detected in the city during the last 50 years. By 2100, climate projections based on data from 1933-2010 show an expected warming between 2-3°C in Sao Paulo alone. Lamentably, this regional warming trend appears likely to only be exasperated by a magnified heat island effect as Brazilian megacities’ populations increase markedly. When one considers that Sao Paulo’s urban area is projected to increase 38% by 2030, the potential water security and food security challenges become increasingly acute. It is difficult to predict if Brazil’s federal and state responses to this vexing crisis will be sufficient to arrest an emerging human security freefall. Thus far, this protracted instance of water stress seems to have deepened distrust in the government’s ability to provide essential security. After all, access to a clean and reliable water supply is a foundational block of human security, and it is hard to see Brazilians not blaming government corruption and ineptitude as causal factors for the crisis (particularly in the context of recent unrest precipitated by concerns over government fraud, waste and abuse surrounding the country’s hosting of the World Cup). To date, there have been no large “water protests.” However, just last year and only a few hundred miles south, a neighboring capital city was gripped by street protests due to similar conditions. Residents of Buenos Aires, Argentina took to the streets en masse to express their anger at the government for the rolling black outs and water shortages across the capital, due to a tenacious and protracted heat wave. When a country the size of Brazil, the most populous and economically consequential nation in South America, faces protracted water stress, with implications for both water and food security, it will have ripple effects across the globe. In this context, elevating water stress and climate change on the international agenda (including the security agenda) should be a key priority for both Brazil, and the broader international community. By Caitlin Werrell and Francesco Femia in climate and security on September 3, 2014 . This article is spot on one of the main issues affecting the whole world nowadays, unfortunately, there’s not enough attention paid to this huge problem. WWIII will not be about land but about water resources. In my opinion, the risks from climate change underestimated by the international community, as deemed relevant regional issues. However, information on the effects caused by climate change, with growing intensity comes from different countries from all continents. Integration of this information and its visual representation allow us to formulate only one conclusion: there is – has already begun to destabilize the world’s climate. Moreover, in the near future may come – in time – “the point of no return”, when any efforts to stabilize the climate of humanity may be useless. When this scenario processes are considered relevant today – the war in Ukraine, the annexation of the Crimea, the activities of terrorist groups, and so on – will be evaluated as a non-serious. Today – it seems to me – the best case scenario is the development and adoption of the international community planetary “Climate Doctrine” and the adoption of UN … leading role in undertaking this work, of course, belongs to the Secretary J.. Kerry, The Center for Climate & Security and military. Thank you.